George Lucas has revealed that Jar Jar Binks, one of the most reviled characters in the Star Wars saga, is actually his all-time favourite. 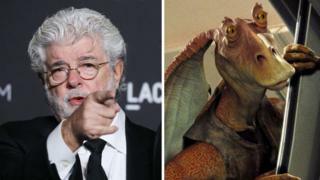 The 74-year-old director made the surprise announcement at a fan event marking the 20th anniversary of Star Wars: Episode I - The Phantom Menace. "[It] is one of my favourite movies and of course Jar Jar is my favourite character," he said via video. The CGI comedy character is almost universally hated by Star Wars fans. He took last place in a Huffington Post article ranking all 93 characters in the film series; while Rolling Stone magazine excluded him from its own ranking of the saga's characters, adding that if Darth Maul was "a figure from one of George Lucas's worst nightmares… where did Jar Jar Binks come from?" Critics described Jar Jar as a dumbed-down exercise in child-pleasing - or worse, a racist stereotype with a misplaced Caribbean accent. Actor Ahmed Best, who provided the voice and motion capture for the amphibious alien, last year revealed that the vicious backlash against the character left him close to suicide. In an emotional post on social media, Best shared a picture with his young son, writing: "20 years next year I faced a media backlash that still affects my career today. This was the place I almost ended my life. "It's still hard to talk about. I survived and now this little guy is my gift for survival." But speaking on Monday, Lucas was full of praise for Best, saying: "Ahmed, you did a fantastic job. It was very, very hard." In response, Best tweeted: "I'm overwhelmed with the love and support I got at today's Star Wars Celebration Phantom Menace panel. "It was very difficult not break down in a puddle of gratitude tears. Thank you each and everyone. Your love is felt so greatly."